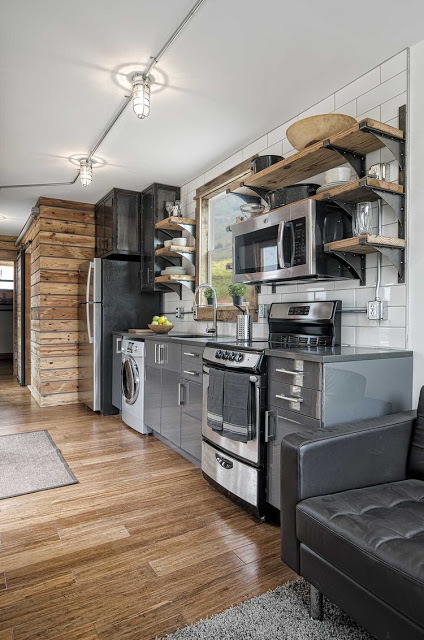 This is the Freedom shipping container tiny house. It’s built by Minimalist Homes in Michigan. Wow. This is surprisingly nice. Probably the best container house I’ve seen. Everything you need and lots of space. The wood floors and partial interior walls. The on picture missing is the living room end. That would be nice to see. All in all, really, really, nice. The bed area is great, too. I like the under bed clothing storage with the hanging pole. Bathroom and all finishes really nice. Front door really nice. The only bumer is the 8′ width. Be great to have all this, only wider – like at least 12′. Two of them side by side with a big opening between them to give 16′ would be ideal. Put them together on-site. For $70K, it would be surprising if it *wasn’t* nice. The plain-jane container house from a couple weeks ago cost 1/3 as much, so we can’t compare. This is it! Everything I need in a tiny home. Don’t want wheels; no lofts; lots of light…. Only thing I would change is to get that bed closer to the floor. Maybe three feet high, with storage underneath, and some sort of closet/storage in the other corner. This is perfect! How do you get on to the roof I wonder? Me hates spiders too… unless of the beverage variety. Very nice! I love the woodwork, and the shower! Quite the place!! The idea of two sleeping places is perfect. The only thing I wish I could do is toss dirty dishes into the washing machine in the kitchen!! I wish I had a tiny house. At that price, I just couldn’t justify it! Nice, and almost indestructible, but one could certainly do it cheaper, and have something just as nice — and even better, more personalized! I looked at making my own shipping container home, but ultimately had to settle on something else — which hopefully I will be able to move into in the next few weeks…… YEAH! is your 5x the size 5 containers put together? would love to see pics!! In total my house is 4 20′ containers, but 2 of them are storage so we really live in just 2, plus an inter-container area I built in. Then I have a large workshop area. I don’t know if you need an FB account to see that or not, let me know if you can’t see it. Brilliant love your Container compound ! My hubby will love your work shop ! Only took me to your FB account and alls I seen was a lot of snake pictures…YIKES hate snakes.. would have liked to see what your containers looked like not snakes..
Hi Jill, I replied but it doesn’t seem to have passed moderation. No idea why. I just uploaded some photos here Carol. No particular order and no captions, I’ll sort it out later but at least there are now some photos online outside of Farcebook. High fives! Our first change to any new abode? Remove the doors from the bedroom closets. We think clothes, hanging and clear-toted, are a design element… softening a squared space and offering a feeling of depth and home-ness. This under-bunkbed works. Nice job. We’re appropriating it. Consider it stole. Design element? You ain’t seen my clothes then. Definitely would NOT be a design element. Nice catch. I com”pole”tely missed that. I really like the way they have left the wiring exposed on the walls and ceiling. Almost reminds me of loft living and makes the space feel bigger. OK I am a fan of this house ! Love everything about it ! I love container homes and this one is nicely appointed. I’m wondering how to get on the roof, too. I don’t know how this tiny house has escaped me, but it is just fantastic…! Love that it was built from a shipping container, it is one of my favorite platform’s to start a tiny house from… Now getting to it’s interior, everything is just so well thought out and brought together in one continues flow from room to room, starting from the French door entry to the loft bed with under storage area, It is so big you could add a desk, and use it as a tiny office…! Great Plan, I would love to see more of these, so long as the costs are held down to a minimum and keeping them affordable for everyone who wants to live tiny and dept free….! Great job on the finished shipping container. A blend of modern with some old style woodwork, a nice combination all around. Three thumbs up! Yes this one is stunning! Who does everyone recommend as the best manufacturer and price combo? Is there a welder in the family? Wondering about where the brackets for the shelves came from. Sorry but I don’t “get” it. I am a great fan of container houses but 70-80K and that doesn’t include the cost of the land, septic, and so on. So you’re talking somewhere around 150K, I suspect, unless you are going off the grid (in which case you still have to pay for the land). I built a tiny house but I also bought a huge home — three stories, with indoor swimming pool and overlooking a river, and at the edge of a quiet town — for 226K. For me, a tiny home shouldn’t be tiny but with a big price tag. It should be tiny in both respects. Even in rural Alaska, where I lived for 34 years, we could pick up a nice container van for 4K. The rest is just workmanship. Have someone else do the electrical, the plumbing, and the front door. The rest is easy, since the exterior structure is already there. PS. And no, you don’t have to be “handy.” This is the 21st century. Just watch a lot of YouTube videos and do lots of planning. Actually George… watching a lot of YouTube videos can be helpful. Or completely the opposite. Both from the information on them point of view, or the homeowner’s capabilities. Some people just. don’t. have. it… skill wise. But they may be total geniuses (genieii?) in whatever they actually do. Plus, I must ask, is your location on the edge of a quiet town in a depressed area economically? If so, perhaps that is “a” reason why you were able to purchase at that price. Just think, in many parts of LA, why you wouldn’t even get an inside dunny for that sort of money. I also might mention that the floor plan isn’t very good, IMHO. Hallways are a waste of space, and if the bathroom’s dimensions are what I suspect, then you are wasting 21 sq ft. That’s enough for a 10’ closet. A more efficient design would be to put the bath at the end. You only need a space 3’ x 8’ to have a roomy bath if you put the sink in the bdr, which is always nice since it doubles as a vanity. And if you wanted to make this super nice then stack two other cv’s on top, in an L shape, put in a circular stair, and you could have two 8 x 20 bdrs, a sitting room and a second bath (all upstairs) and a laundry room and large storage area downstairs, double the size of the living area – plus have a two-car garage or carport. Also, I would put in a U shaped kitchen. The dining area seems tiny. Either delete it or use part of the (much bigger) counter space for eating. Nor would I ever put hardwood flooring in a CV house. Waste of money, and since most hw flooring need gluing, they can be a misery to take apart (been there, done that). Just use laminate flooring. Cheaper, simpler, easier to replace. I don’t mean to sound negative, for I love tiny houses, but to me this is way overpriced and inefficiently designed. George, where I live you get a condo for $225,000. And I am sorry, there ARE people who do. not. have. construction. skills. No matter how many You tube videos they watch. Nor the creativity to design and construct a home of any kind. Personally I enjoy the challenge of learning new skills and have a knack for design etc. I too could probably make it for a lot less but that is not the point. The point IS that this is a beautifully designed and professionally built container home for the purpose of selling it. I used to cut my own hair. It cosy me nothing and it didn’t look bad. But now I can afford it so I pay for a hair dresser to style and cut my hair and it looks much better. Everyone deserve’s to be paid for their talents and hard work and everyone has the option of DIY. I personally like the design of this home, but even if I didn’t I wouldn’t pick apart every tiny detail. I see no point in adding a 2nd floor and I happen to like the hallway. To each his own. I agree that this is like the best container home that I have seen this year. It would have been good to see more of the living room side and the roof top deck. How do you get up to the deck? All and all I really like your work and concepts. Thank you for sharing. Nice, but a hallway in an 8′ wide isn’t a good use of space. Try to keep all passage spaces dual use. I love this design even with the ladder into the sleeping area. It is not as high as a loft and I think that makes it more accessible for older people like me. I’m really glad you liked it — even with the ladder!